Happy National Volunteer Week! Thank you volunteers! Thank you for your effort, time and talent you donate to help better the lives of cats in Toronto/GTA and Kitchener-Waterloo. 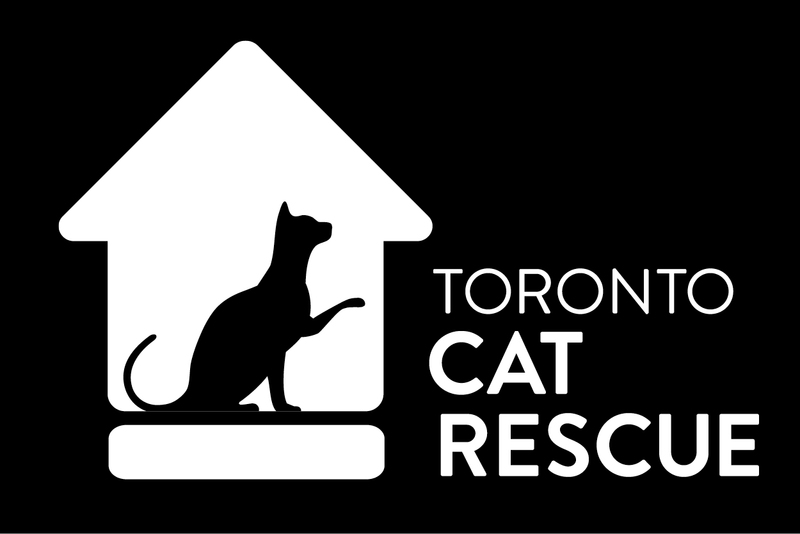 Whether you volunteer once a month, or ten hours a day, you are part of the Toronto Cat Rescue (TCR) family… and you are making a positive change in this world for felines. This week we are highlighting some of our most dedicated volunteers – volunteers who have been with Toronto Cat Rescue the longest. Thank you!! Pictured: Finnegan and Loralie – both TCR adoptees. I joined TCR in 2006 as a foster mom. After a foster fail (Finnigan and his sister Pants) I started helping with design materials which I still continue to do along with our annual Bowl-a-thon. I am also the HighPark adopt-a-thon driver a.k.a Cat Chauffer. I feel very strongly about volunteering for animal welfare. Cats in particular have always been an emotional lifeline for me. I stay with Toronto Cat Rescue because I know that this organization is helping the feline population in the GTA in a big way. I have been with TCR for about 14 years. It started when a stray cat came limping into my backyard. His name was Stripes and he was with me a long time. He wouldn’t come in the house, but loved being patted and would even sit still and let me cut the matts out of his fur. Then a litter of four feral kittens showed up in the backyard. I was put in touch with Ferne, (the original president and founder of TCR) and she helped me get them sterilized and vaccinated. Two of those kittens were socialized and got adopted, and one lived in my backyard his entire life and would often come in the house. About ten years ago, TCR partnered with a brand new veterinary clinic and I took a more active role of coordinating appointments at this clinic for the foster cats. I now oversee four vet clinics and liaise with other TCR team members to efficiently manage the medical care of cats in our program. Dyann’s husband Peter with their backyard feral, Buttons. My husband and I are both cat lovers and I finally agreed to let him keep Bentley, the last cat we fostered. Bentley has become a very loving addition to our home. I love all the TCR volunteers that I work with. They are all so dedicated and supportive. I love that I learn something new every day. I also love the vets that we work with and have developed a very close relationship with them. We are a very close knit group advocating for a great cause. Twelve years ago, just after my family adopted a cat from TCR, I became fascinated with the cats on the TCR website and watching as their pictures went from available to adopted. I spent time on the site reading cats bios and being excited when they found adopters. I figured there was probably a better way to spend my time, so I filled out an application to become an adoption counsellor. My first role with TCR was matching cats in the program with prospective adopters and talking to them before they adopted. Quickly after, I became a foster home as we all know it is hard to resist cats in need! Then, I started organizing adopt-a-thons at the closest TCR partner store to my house. Since then, I have been driver coordinator, post adoption counsellor and lead, board member, vet coordinator, event coordinator… the list goes on. I stay with TCR not just because I have a history with the organization, but because I have seen this organization grow from a very small grassroots rescue to one of the biggest (if not the biggest) cat rescues in Canada. And TCR isn’t just big – it is mighty. TCR has strength in its volunteers who are willing to devote their time, energy, and lives to working with the cats in our program. TCR rescues and adopts many cats in a year and it is a testament to the hard work and commitment of our volunteers and donors who care so much about the well-being of our cats. It is inspiring! TCR has met many milestones over the time I have work here and I look forward to many more! Linda’s TCR cat Taylor, in loving memory. Gone but not forgotten. I have been actively rescuing cats since the early 90s and became involved as a volunteer with Toronto Cat Rescue in 1998. I recall the early days of TCR when the founder stepped up to help the cat overpopulation problem in Toronto. Back then, too many cats were being euthanized due to lack of space and resources. Back in 1994 when the organization first started, it was the goal of TCR to eliminate cruelty and homelessness for the cats by providing a foster and adoption program. The objective is, and continues to be, one that provides second chances to cats already born and in need. And to also provide education about how to prevent unwanted litters every year. In the 20 years I’ve been with this organization, TCR has changed and grown vastly; it has transformed from a grass-roots, back-yard rescue group into a powerful and sophisticated organization which the city of Toronto really needs. I truly am pleased that we have a working relationship with our local shelter as it is the most effective way to reduce the euthanasia numbers in the city of Toronto. And we have built up quite a network of foster homes to make that happen. I have had the most rewarding opportunity to have fostered many special needs cats, post surgery, and socialized many cats and feral kittens that would not ordinarily have the chance to be placed in a home. I stay loyal to TCR because of what I know about them from experience over the years and I have a deep passion for the cause. Being under the umbrella of a prominent rescue group like TCR provided the shared resources required to rescue more cats, and follow each success story through to its destiny. TCR does a wonderful job of networking with many organizations and volunteers to continue their life saving work. And it is that teamwork which makes me support the organization. Since retiring in 1999, I started actively volunteering in the cat rescue community in Toronto. I joined TCR in 2005 and have held many roles within the organization over the years, including adoption screener and foster home. When TCR decided to start a new education program of helping the public with stray and feral cats, I was one of the first volunteers to be recruited. I loved that I could work from home and give back to the community. My 29 years of experience as a social worker was the perfect fit for the Stray Rescue Coordinator position. I spent many hours helping members of the public deal with a cat they had found, but couldn’t keep. To have witnessed so many of those needy cats getting a second chance has been extremely rewarding for me. My husband and I share our home with five beautiful senior rescue cats. I am a mother to two amazing adult daughters who both have TCR adopted cats. In my spare time, I enjoy native perennial gardening, cycling, hiking, swimming, and reading. I feel very lucky to have an active life and looking forward to being a part of TCR for many years to come. Pictured: Randee a foster kitten who came to Jenn with a broken leg and they couldn’t resist adopting. I have been volunteering with TCR for 16 years. I can’t believe it was that long ago that I stumbled upon this wonderful rescue group at my local Pet Valu store on Dundas St. in Toronto. That day definitely changed my life! Over the years I have watched TCR grow from about 5 volunteers to the hundreds that we currently have. I have watched the impact that TCR has made grow in numerous areas. I have watched thousands of cats, many sick and injured get adopted. I have been part of the decisions that helped grow our group to what we are now. Though there have been difficult growing pains over the years, the positive outcomes, relationships and memories far outweigh the tough ones. I truly feel TCR is part of my family, and the friendships I have made through my volunteering are deep rooted. I have so much respect for the incredible, dedicated volunteers I work with every day. I have been fortunate to experience many different roles within TCR, allowing me to learn so much about all areas of rescue work. I have been very lucky to be able to develop and create my roles as TCR has grown and extended its reach. I appreciate the trust I have been given to run a chapter of TCR. I currently look after the Kitchener/Waterloo and surrounding area chapter of TCR, looking after the variety of things that go along with that role. It keeps me very busy, but I have wonderful volunteers who help make this chapter successful and allow us to rescue hundreds of cats. We have certainly made a huge impact in this area. I share my home with three adopted TCR cats and I still foster cats and kittens. Over the years many sweet faces have touched my life as my family and I opened our home to them. Truly my heart and passion is in the “rescue” work that TCR supports and this is a big reason I love TCR. We take the cats that need our help and we find them families. We take the cats that are injured or that no one else can help and we find a way to help them. This is what keeps me going day after day – knowing there is another cat out there that needs TCR! My husband, Mike, and I have been volunteering with TCR for almost a decade. We’ve completely lost count of the number of cats we have fostered, but it is well into the hundreds. We have fostered adults and kittens, healthy cats and very sick cats, and cats with one eye or three legs or other injuries who needed to be nursed back to health before moving on. We’ve fostered cats of all temperament. In addition to fostering, we try to do pickups or deliveries of large donations (usually pick ups from Toronto), or when space allows we store large donations at our home to be dispersed among other fosters. We will be hosting this year’s garage sale as a fundraiser to help with medical costs. My role with TCR is multi-faceted. I am a professional pet photographer and volunteer my time and expertise by photographing cats in the Kitchener-Waterloo area, for the web page and for social media use. TCR is like family to us, and we hope to continue to be involved in some capacity for the foreseeable future. I learned about fostering from a cashier at the Kitchener PetSmart in 2008. I applied that evening, and within four days I had my first TCR fosters. I was just testing the waters, though, to see how this would work out with my own pets. Gradually I renovated my home gym and created a five star kitten room. I’ve gained fifteen pounds, but those babies just keep coming. Along with fostering, my main contribution has been working many many hours at adopt-a-thons. Look at that face… how could I not stay involved with TCR? In the Spring of 2006, I attended a general volunteer meeting where I learned all about Toronto Cat Rescue. I was inspired to volunteer to help this lovely grassroots rescue create a Communications Team (which paired nicely with my Media-Investment background). With the help of a small team, we created the first “TCR Monthly Newsletter for Volunteers and Adopters”. After many years the original team is no longer in place, but TCR’s Communications Team has continued to engage and support “everything TCR”. I have volunteered for TCR in many roles, but the two that stand out the most to me are TCR’s Facebook Page and the website, including the Cats Available For Adoption pages. In 2007 I had an idea to create a TCR Facebook Group, so that we could test and learn what this emerging social media channel could do to help cats. The small group that used to let me privately message all the individuals private inboxes has now morphed and grown into a successful Facebook page with 13,700+ amazing supporters. This page is “my baby” with only a handful of other people ever having created a page post, or answered a private message. In 2008, I began to manage TCR’s website and all the cat postings. Now with a very helpful and dedicated Volunteer Posting Team, we have helped many felines find their forever homes. I have personally posted over 10,000 cat bios, which is my favourite thing to do as it connects cats to their families, and also highlights the efforts of all of our amazing foster families. I have learned that even the oldest, naughtiest, unhealthiest cats have their second chance to find happiness because of TCR… and the very best part – they do! Every cat does get adopted, and that is truly magical. TCR has grown and changed over the past 12 years, and I hope that it continues to get stronger because with change and growth even more miracles can happen for the cats of Toronto/GTA, Kitchener-Waterloo… and beyond! Sarah’s passion for the environment and animals started from a very young age. This has guided her throughout her life and she has always wanted to be a leader and change-maker. A TCR volunteer since 2007, Sarah started out as a trapper for several feral cat colonies and slowly took on more volunteer roles for TCR, including foster home, foster coordinator, store coordinator, adoption counsellor, and the coordinator of TCR’s two signature fundraising events – the Scotiabank Marathon and the Bowl-A-Thon. Sarah is currently the Chair of TCR’s Board of Directors. She works professionally within the charitable sector as a fundraiser and brings her fundraising experience and knowledge to the Board. Sarah completed her undergraduate degree in Environmental Studies at York University, and has a post-graduate certificate in Fundraising Management from Humber College. I’ve been committed to cat rescue and to TCR for 10 years now. Actually, the black beauty in this photo was the very first cat that I ever rescued. She was 4 years old when she became a part of my heart and a member of my family. She lived to be 14 years old and has been an inspiration for me since the day I met her. I embarked in rescue in March of 2008 because I felt it was a social responsibility to ensure better lives for my community stray cats. Being in rescue is hard work. It’s emotionally and mentally draining and there have been many times over the years that I’ve wanted to walk away from sheer exhaustion; but the need is so great and these domestic beauties deserve a fighting chance. For me, getting involved means staying involved until there is no more need for rescue organizations. I feel that TCR is a gift from the universe. I simply could not accomplish what I do without their support and dedication. It makes me proud to be a part of an organization with such a robust foster and adoption program. It is because of TCR that tens of thousands of cats are safe and warm indoors, sleeping comfortably on someone’s lap. Just the way it was intended to be for our companion animals. I started fostering with TCR in 2006. I grew up with cats and have only ever spent one long year without any cats in my home. As a student I wasn’t sure about having a cat of my own but I found TCR and the foster program and it seemed like a perfect fit. It was a way to have cats in my life while doing something important for the welfare of cats in the city. I have been fostering for over a decade now and through all the ups and downs (and difficult farewells) I have never once regretted it. A couple years ago I decided to expand my role by taking another volunteer position with Database Administration, first as an Outcomes team-member and then recently as a team-lead. It was a way to further contribute to the organization that I had been a part of for so long, but in a way that still fit my interests and lifestyle. This position has allowed me to have a much better understanding of how TCR works as an organization; its tremendous scope, and the many people who are responsible for making it work by donating their time and energy. I have gained a much better appreciation for the hard work and dedication that is required to keep an organization like this running and how important it is to contribute in the ways that I am able. I love cats. I want to help the cats in this city as much as I can. TCR allows me to find ways to do this. It allows me to meet all sorts of people who share this love and these goals and who work very hard to achieve them. Very selfishly it also allows me to meet, cuddle, and play with all sorts of wonderfully adorable cats and kittens, all of whom I miss terribly, but know that they have great homes where they can be loved and cared for while I can provide that for more cats who need and deserve it. I admire TCR for always adapting and improving and I look forward to continuing to be a part of this growing community. If you want to join the TCR family by volunteering, or if you would like to increase your role(s), please check out all our volunteer roles that need filling today: Volunteer With Us… we would love to have your on the team!